With more than 350 participating chefs representing 175+ businesses, CUESA’s Market to Chef Program reaches deep into the culinary community. The program supports chefs through exclusive access to priority parking and equipment at the Ferry Plaza Farmers Market, a quarterly email specific to industry needs, and invitations to CUESA’s cooking demos and fundraisers that increase chefs’ public visibility. Started in 2004, CUESA’s Market to Chef Program has been critical to the vitality of the 115+ small farms and food craft businesses that sell at CUESA’s farmers markets. When cold-weather days deter home cooks from shopping, chefs reliably arrive to purchase produce in high-volume for their establishments. Some farmers report that upwards of 50% of their sales comes from chefs during certain times of the years. CUESA’s Market to Chef Program is sponsored by Culinary Agents, a professional networking and job matching website designed for current and aspiring professionals in the food, beverage, and hospitality industry. Culinary Agents’ technology and services are a cost effective way for businesses to source all levels of culinary, pastry, wine & spirits, dining service, and office positions. Culinary Agents has an automatic matching process, which tees up opportunities to talent and talent to businesses, along with tools to support applicant matching, messaging, and management. Their website also enables talent to represent themselves professionally, seek out job opportunities, and get inspired by virtual mentorships. Culinary Agents is active in 30+ cities, working with some of the best talent, restaurants, businesses, schools, and nonprofit organizations nationwide. 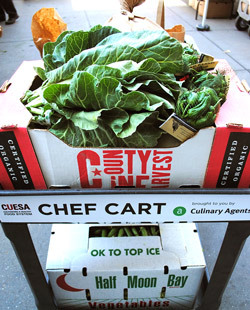 CUESA (Center for Urban Education about Sustainable Agriculture) is a mission-driven nonprofit organization dedicated to cultivating a sustainable food system through the operation of farmers markets and educational programs. CUESA manages the Ferry Plaza Farmers Market and remains a cutting-edge force in influencing how people grow, produce, and eat food in America. Pictured above: Chef Anna Derivi-Castellanos of Three Babes Bakeshop with farmer David Winsberg of Happy Quail Farms.